At the foot of the steps leading up to the gravesite, a spigot, perched on a length of lead pipe, juts from the ground like a broken sign post. I stop to fill my bucket, twisting the handle until I hear the whistle of water racing up the pipe. It’s a futile measure: The flowers are already wilted and soon they’ll be baking on a headstone in the punishing August heat. The spigot coughs up two bursts of rusty vapor before clear water begins to trickle out. I wonder how much distance there is between the plumbing and the caskets and which was buried first. And what if one of the pipes sprung a leak? — pounds of pressure firing water into the earth, loosening the soil, shifting coffins from beneath their headstones. I twist the handle back and wait for a moment while the water soaks the dry stems. 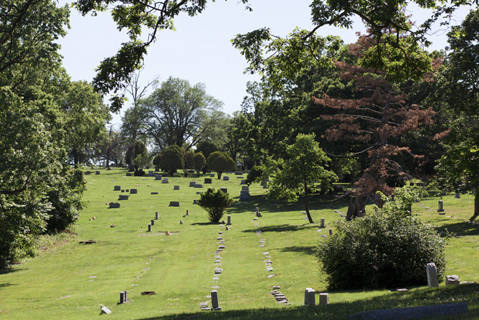 Despite the heat, the grounds of the cemetery are a hundred shades of verdant green. Strange that the signs of life should be so abundant in a resting place for the dead. This isn’t my first trip to Mount Washington. I come to the cemetery most years as a favor to my mother. I guess she comes as a favor to hers as well. As we stand over my grandmother’s grave, wiping the sweat from our faces, my mother asks me what I think about the flowers she set there. I don’t have an opinion, but say they look nice just the same. It’s always been hard for me to understand why people visit other people’s graves. A headstone strikes me as a poor monument to a human life, especially when compared with the depth and vibrance of living memory. But I assume the practice is better understood once you’ve lost someone close to you: a mother or father, a sibling, spouse or friend. My mother squats down and starts rearranging the flowers. There’s a conversation between her and my grandmother that I don’t have ears to hear. “How’s that?” she asks me. “Looks nice,” I say. Once upon a time, Mount Washington was underwater. In 1886, fifteen years before the cemetery’s founding, Washington Amusement Park stood in its place. 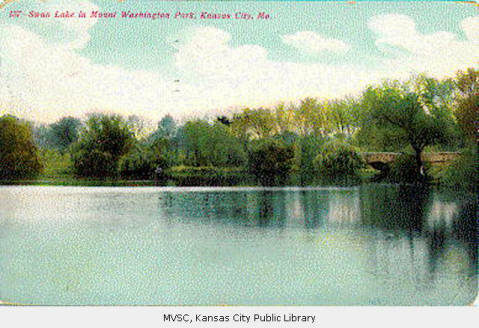 The park’s owner, Willard Winner, a visionary real estate tycoon and president of the Kansas City Independence Railway — called the “Dummy Line” because its engines were draped with canvas so as not to scare horses — envisioned a swimming and boating lake as the center of his woodland fantasy land. Winner damned a creek which ran through his property and flooded twenty of his twenty four hundred acres. In the resulting reservoir, he anchored a broad-decked showboat and built a bandstand on a small island at the center of the waters. The park soon played host to the revues of popular acting troupes and many of the country’s best brass bands. On a summer’s evening in 1887, the melodies of the Stephen Foster songbook could be heard echoing through the woods of Independence. For a few years, crowds flocked to the park on Winner’s interurban railway and the fortunes of its founder multiplied. But, in 1890, the bottom fell out of the local real estate market, and Winner — deep in debt from various investment schemes — was eventually left penniless. As his credit dried up, so did Washington Amusement Park. The lake was drained, filled and landscaped to make way for a new cemetery. The symbolism couldn’t have been lost on Winner, who’s days as a powerful real estate mogul were likewise buried at Mount Washington. On his death in 1929, however, his body was buried elsewhere. My mother and I drive from my grandmother’s grave to another family plot at the far side of the cemetery. The grounds of Mount Washington are expansive, covering 200 acres and interning more than 60,000. In the thickly wooded hills alongside the road, Gothic chapels and Greco-Roman styled mausoleums emerge half hidden in the foliage. The whole cemetery is a monument to a lost culture of mourning. The towering memorials — tombs, crosses and obelisks embellished with fantastic, almost occult designs — evoke a century in which solemnity mixed freely with public spectacle. The discrete, orderly rows of knee-high headstones that describe the modern cemetery tell a different story about our relationship to the dead. These are places to visit only infrequently. Broad access roads make it easy to drive in, pay your respects, and drive out. By contrast, the cemeteries of the 19th century — the century to which Mount Washington belongs — were conceived as gardens of meditation, places where mourners could linger and invite their memories to blur the boundary between the living and the dead. Today, of course, memory is something profane: a metaphor for available space, the capacity to store information. Perhaps this is one reason that the dead seem so distant. We always get lost on our way to the Scarritt plot, which, like a wayward constellation, seems to change location each year. The Reverend Nathan Scarritt, my great grandfather three times over, was a pioneer missionary who traveled the Kansas territory bringing Good News to the natives. As part of his clerical duties, the Reverend buried Shawnee, Delaware and Wyandotte Indians all over Johnson County. Some allege that the suburbs of Leawood and Overland Park were constructed on top of countless Indian remains. I once met a man who even blamed the ill fate of a few corporate office parks on their unknowing proximity to Shawnee burial grounds. Hearing his story, it occurred to me that the folklore of the Indian burial ground, the resting place which punishes all who disturb it, provides a perfect counterpoint to modern attitudes toward the dead. In the former, the dead assume a fearsome power over the fortunes of the living whereas, in the latter, they’re at the mercy of the living even to be remembered. Once we stumble upon it, as we always inevitably do, I’m relieved to find that the Scarritt plot is covered by the shade of a broad oak tree. I lean against the trunk and enjoy a rare breeze which cools the sweat on my face and arms. My mother is already at her divinations; bouquet in hand, a musing artist before her canvas. As she surveys the headstones, I wonder at her ability to see flowers in things. It never occurred to me that one could have vegetation for a medium, or that this medium could be a medium between the living and the dead. But, where once we slaughtered a fatted calf, there go some lilacs and a plastic flag. Our ancestors have become much less demanding, or else we demand much less of them. After the flowers have been set and a few moments of silence observed, we pick up our buckets and head back to the car. There are no more graves to visit; it is time to return to the land of the living. As we steer the narrow road back toward the entrance, I suddenly think of Willard Winner and wonder who’s standing over his grave. More even than those who I’d come to visit, I feel Winner’s presence here, hanging in the air like smoke from a distant fire. There are no flowers left, so I pay my respects the only way I can. I try to remember the glory days of Washington Amusement Park. A ferry saunters on its way toward an island at the center of a placid lake. The sounds of laughter and spirited conversation mix with the bright timbres of a brass band. Suddenly, the polished lid of a coffin surfaces in the water alongside the boat. Soon dozens more emerge, twisting and bobbing in the ferry’s wake. More and more begin to appear, filling the surface of the lake like hundreds of overturned skiffs. The sounds of the brass band are interrupted by the collecting screams of passengers until finally the musicians themselves lower their apertures from gaping mouths. The waters are covered with caskets from shore to shore. Over a chorus of wails and indignations, only the relentless thump of wood knocking against wood can be heard. Eventually, the ferry is lifted out of the waters, teetering on the unstable precipice of a growing mountain of coffins. Willard Winner watches the spectacle from the shore, but the expression on his face is indistinct. Standing on the other side of one hundred and twenty years, I smile, pleased to imagine that time might fail to stand between the living and the dead.